Picture Credit:Furniture Modern Latest Furniture. Ceramic earth tone flooring, rustic vanity, and modern looking windows, very smooth colors. Slippery when wet! The bathroom is the only one wet floor in your house. While thinking hard about the bathroom flooring ideas, safety, cleanliness, moisture holding up capacity and durability take place before the decoration and aestethic appeal. In bathroom flooring ideas, those above parameters can be used in shower floor and bathroom floor itself. The most common materials for wet flooring are ceramic, marble, granite and mosaic tile or pebble stone. These materials can be combined or used separately in the shower or in bathroom floor when bathroom-flooring is considered. These are also known as the hard tiling. Soft tiling is very old fashion in our days. Rubber, water resistant carpets and vinyl cannot keep their popularity more than a decade. Picture Credit: Michael Abrams Limited. Heated ceramic, rectangle floor tiles match with glass tiles. 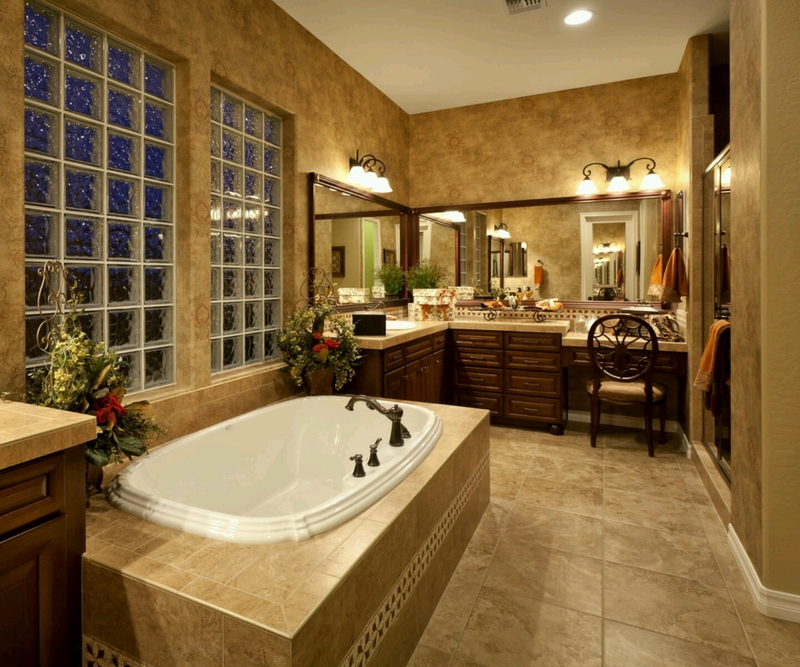 Kohler porcelain vessel sink and frosted glass door and window makes this bathroom very classy. Picture Credit: Zieba Builders Inc. Flooring is very unique, filled travertine. Contemporary bathroom design is completed with beautiful painting looks like a picture. Picture Credit: Htbuilding. Fresh lime color honeycomb mosaic flooring and nice set up, the towel bars are heated. Your flooring’s best buddy is the backsplash or wall tiling. If buddies speak well and understand each other, your bathroom remodeling is very easy and your end work seems dramatic. On the other hand lighting affects the flooring. Under the worse lighting your paid well flooring looks the serendipity. Either combining wall tiling and flooring is making opposite color selection or transition color selection. Remember to follow your bathroom style by adding colors. 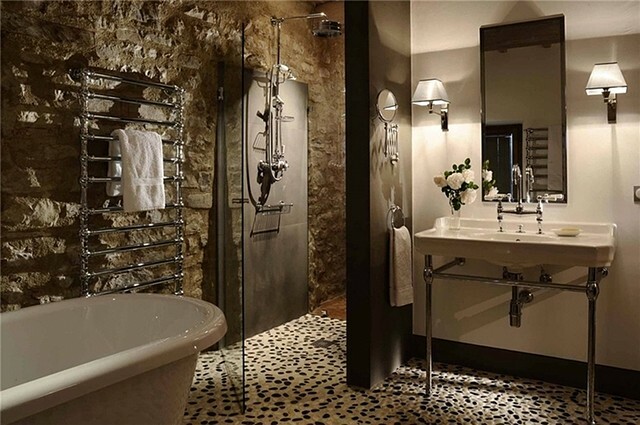 Regarding to your bathroom design, you can add some taste as like as adding border, small connection element, smooth looking, deep looking, or sharp looking bathroom flooring ideas. Picture credit: Home Bunch. Cream and black pebble flooring and natural stone tile wall covering. Very strong freedom feeling. Picture Credit: Milk and Honey Interior Design. Marble flooring with borders. Like Sultan’s bathroom. If your bathroom is very small wall tiling and floor tiling should be lighter colors. Your flooring should be covered with bigger tiles or like flat surfaces. Small tiles, mosaics and pebbles make the space smaller but some infinity feeling mosaics keep the eyes busy in your small bathroom and design has been fitted well. If you would like to use the opposite colors in small spaces, wall surfaces go for lighter while flooring remains dark. The ideas are endless; I am hoping to see your ideas below the comment section.